Some of us already know that cigars have their perfect shape because they are placed into cigar molds before the wrapper leaf is applied. Although figurados, (cigars with tapered ends) were once formed only by hand, cigar manufactures are now using cigar molds for these odd shaped cigars as well. But the use of cigar molds doesn’t mean just any torcedor (cigar roller) can create these unusually shaped cigars. 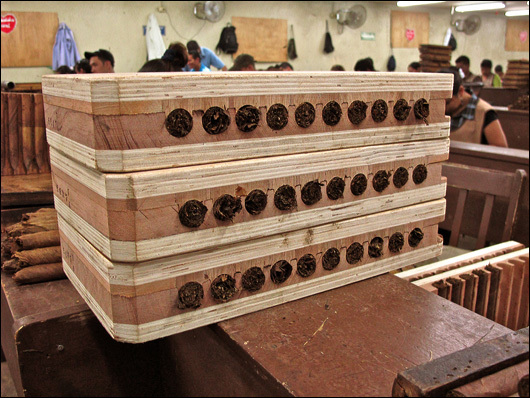 Figurados, which include perfectos, torpedos, pyramides, belicosos, and solomones, are hard to roll regardless of the mold and are made only by the most talented torcedores. This may sound funny to you but I always like to try new things and challenges. Last winter I ordered tobacco seeds on line and planted a small crop here in Michigan. For the last four weeks I have been harvesting my tobacco. It is quite a process. I’ll have to age it for several months before I can try one of my own home grown cigars but I’m lacking one thing. I need some cigar molds. I saw the picture of the molds you use and was wondering if you could send me instructions on how to make a mold. Do you use cedar for the mold? I want to make churchhill size cigars. Any help you can offer would be greatly appreciated. Hi Luke. I will be updating the captions on these photos. I took these pictures in Nicaragua in 2010 while visiting the AJ Fernandez factory in Esteli. But if you need cigar molds, look online. There are a few websites that offer them. Here’s one: https://www.leafonly.com/cigar-tobacco-leaf. You can also find used molds on Ebay. Please let us know how your project turns out!